designingbonsai.com  "for the art of making miniature trees"
Designing Bonsai is a free informational site from a group of bonsai enthusiasts in Athens, Georgia, "Home of the University of Georgia" in the sunny south. The art of bonsai design is a creative, challenging, and rewarding hobby for individuals, groups and garden clubs. Our group started working with bonsai in 2000. We do it for fun, gardening knowledge, and creative design. Growing miniature trees dates back more than 2000 years ago in the Far East. Paintings from these ancient times show that miniature trees in shallow containers were used for indoor decorating and were given as gifts. We give "how-to" information for beginning bonsai enthusiasts, terms for understanding the craft, help for growing in different environments and how to keep your bonsai healthy. Whether you collect bonsai from the wild, buy ready-made from a store, or start your own from good stock, this site will be an easy reference point. Live bonsais are sometimes ancient, even hundreds of years old, sometimes decades old, often only a few years old. The art of bonsai is to make any aged tree look like a mature or even ancient tree but in miniature form and basically true to its counterpart in nature. So, the idea is to create an illusion through your own artistic design ideas. Choose a tree from a species that you appreciate, and make a free-form, unique bonsai, or you can copy a specific tree of that species that you especially like. Click on "Starting Up" to see the most popular bonsai styles in practice today with examples of trees that naturally go with the described styles taken from nature. See a 380 year old tree from the National Bonsai and Penjing Museum in Washington D.C. on the "Bonsai Gallery" page. © Copyright 2000-07 Designing Bonsai, Athens GA. All rights reserved. 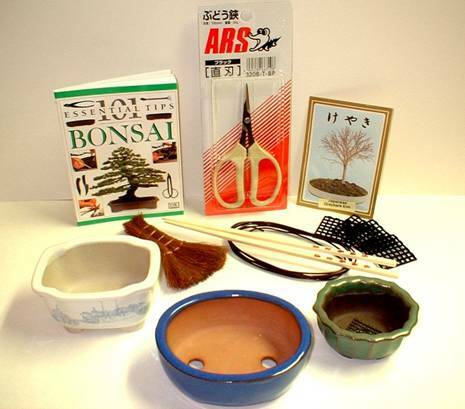 Basic tools for beginning the art of bonsai design. Improvising on tools: For the trimming shears above, any small, sharp, 2" bladed shears will work fine for small leaf, limb & root pruning. Seed pack for bonsai propagating - sewing seeds can be done in any trays or pocketed flats made of plastic or clay. Small paint brushes with natural bristles will smooth off the soil surface of the planted tree. Chopsticks or similarly pointed tools are useful for separating roots from soil and also for tamping down soil in a pot. Use suitable gages of aluminum wire for holding limbs you are training to go in a certain way. Any small mesh plastic screens or pebbles can be used to keep soil in tact. Authentic bonsai pots are recommended for finished trees for the finished bonsai appearance. Individual American potters are getting into the business of making shallow bonsai pots. Many nurseries & online stores have them. Shallow pots elude to a landscape, and they provide different sized beds for trimmed root systems to fit snuggly. Over-wintering bonsai stock in clay and plastic pots with various other plants in a mulch bed in Georgia (zone 8). Pots are partially mulched into bark and soil so roots can reach nutrition and water when they need it. Pine straw is added all around to blanket against wind and frost.